Next week there are two great events to get along to if you can: a trunk show by Saint Crispin’s and a drinks evening with Camps de Luca. The Saint Crispin’s event takes place in the Drake’s store on Clifford Street, from Wednesday May 13th to Friday May 15th. Saint Crispin’s produces a beautiful shoe (see above) but perhaps more importantly offers a unique combination of handwork and fitting. The welt is hand-sewn, which you don’t find on any English ready-made shoe (just bespoke). And for a small extra charge the team will adjust a last to fit your foot, so the fit approaches bespoke too. Definitely worth popping along (although I warn you, it can be dangerous). On the Thursday night, the 14th of May, Gaziano & Girling will also be holding an event to welcome Parisian tailors Camps de Luca. 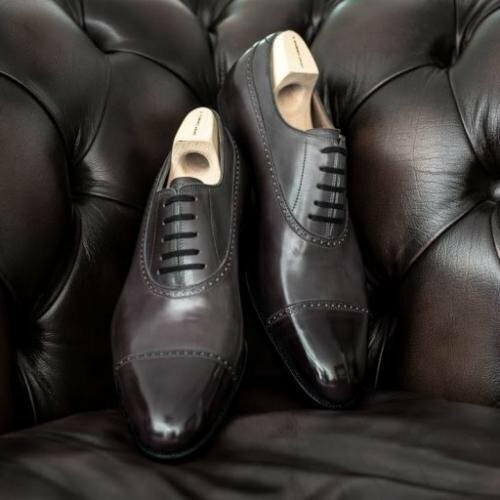 Since Gaziano & Girling opened their store on Savile Row, they have been planning a series of events in collaboration with their favourite makers from around the world. Earlier in the year they organised a day with Chittleborough & Morgan, demonstrating crafts of both tailoring and shoemaking, and now it is time to host superb tailors Camps de Luca. The event is open to all, so feel free to go along and see some examples of Camps tailoring, as well as meeting Marc and Julien de Luca. You can follow the discussion on Saint Crispin’s and Camps de Luca visit London by entering your email address in the box below. You will then receive an email every time a new comment is added. These will also contain a link to a page where you can stop the alerts, and remove all of your related data from the site. What do you call the style of oxfords pictured here? Some call them balmorals (not in the American way) because they follow the style of balmoral boots. Others call them galosh oxfords. Are you aware if one term is better than the other? It’s such an uncommon style, but it looks quite elegant. I first noticed St Crispin when I fell in love with whole cut loafers. Strangely, their new website doesn’t show any. And judging from the prices of those shoe models advertised, I must buy my first whole cut loafer elsewhere. Is there a great difference between hand and machine-sewn welts? At times, I really wonder whether you would still stand by your opinion once stated in your famous piece on “the diminishing return of shoes”. I love it when old posts come back to haunt me! Does anybody here have any advice on dressing as a summer intern in the city? Anything that should be avoided at all costs? Any thoughts on french cuffs? Have a read of the post ‘Working in a bank’ David – plenty of advice there. In short, do not stand out! Thanks for the advance notice Simon; both events beckon. You mention the (understood) dangers of the beautiful St Crispins, if possible could you give an indication of their RTW prices (have checked old posts but could’t see anything).